When deciding which turkey setup to use for your dinner, there are many factors to consider, such as flavor and texture scalability, equipment availability and reliability, cost, and preparation and cooking duration. Here is a list of commonly used turkey setups, with a short description of each, including pros and cons. Keep in mind that every dinner has different requirements, so there is no single, correct turkey configuration. The only thing that is certain is that you must completely thaw any frozen turkeys before using them in these setups. Note: This is a Thanksgiving-themed parody of the 5 Common Server Setups For Your Web Application article. The whole turkey is roasted in an oven. For a basic roasted turkey setup, the bird should be oiled, seasoned, then cooked and basted throughout the cooking process. It is fairly flexible, as the flavor and texture of your final product is scalable by making adjustments to spice allocations, and cooking temperatures and durations. As this is the most popular turkey cooking method, many recipes are available for roasting your turkey and it is an easy way to get your dinner up and running. The whole turkey is smoked in a smoker, using wood chips to generate the smoke. This setup is similar to roasting, except the smoke from the woodchips provides the heat and infuses the bird with its unique, smokey flavor. As the second-most popular turkey cooking method, smoking your bird is a good way to scale the flavor of your dinner in a different direction. It is also just as fancy as roasting. The whole turkey is dipped into a vat of hot oil. This non-traditional setup allows for great flavor scaling and performance that even the most traditional dinner user can enjoy. Good if you're looking to increase your turkey's flavor to impress your dinner users. 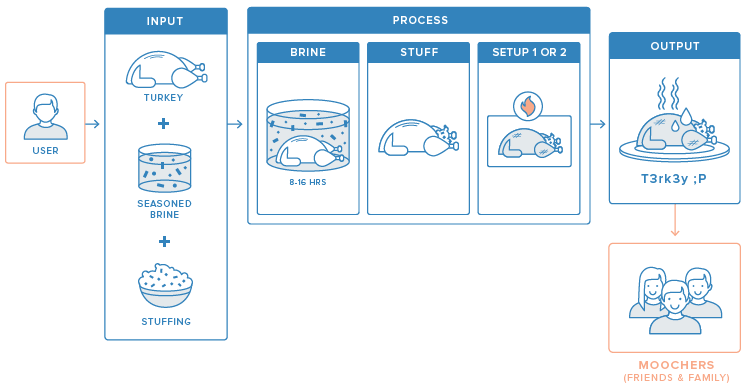 Brine can be added to a turkey setup to vertically scale flavor performance and availability of moistness. The whole turkey is soaked in a salt and seasoning bath for 8-16 hours before cooking. If using a long-duration cooking method, brining your turkey before cooking it will ensure that it not dry out before it is time to deploy your dinner. If you have enough time before you are required to deploy your dinner, you should almost definitely use this setup if you are planning on using a long-duration cooking method (roasting or smoking). The cavity of your turkey is stuffed with starches, spices and herbs, vegetables, and other edible items before the cooking process. This setup can increase performance by balancing the load of your dinner users between stuffing and turkey requests. If you are roasting your turkey and want to provide another resource for your dinner users to consume, consider using this setup to increase your turkey-based performance. Eventually, all of the output will make it to the dinner table, where it can be served up to your dinner users. Now that you are familiar with some basic turkey setups, you should have a good idea of what kind of setup you would use for your own dinner(s). If you are working on improving your own dinner, remember that an iterative process is best to avoid introducing too many complexities too quickly. Don't forget to make gravy!